Stock your pantry with some of my favorite essentials for restaurant-quality Chinese cooking! 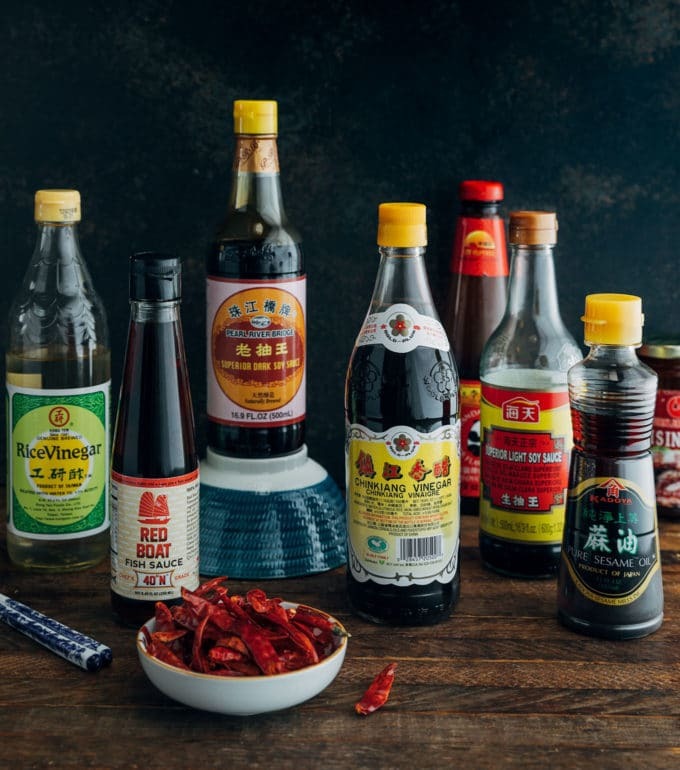 From the different types of soy sauce to rice wine, black vinegar, oils, and more, you’ll be able to navigate the market and learn what makes each of these ingredients distinctive with this guide. Perhaps the most well-known Asian condiment, soy sauce is brewed from fermented soy beans, salt, water, and in most traditions, wheat. 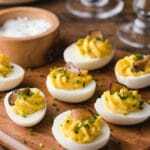 It has a salty, umami flavor and can add both flavor and color to recipes. Each country and cuisine has its own soy sauce, with variations in style and flavor. 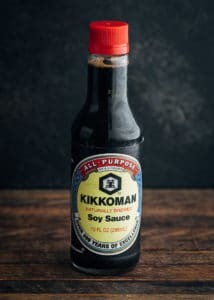 The two soy sauces you’ll most often find in US markets are Chinese and Japanese. For the most authentic experience, try to source the Chinese soy sauces described below. If you’re unable to find them, you can substitute all-purpose Japanese soy sauce. One of the two primary types of soy sauce used in Chinese cooking, light soy sauce comes from the first pressing of soybeans. It is lighter in color than dark soy sauce, and also a bit saltier. 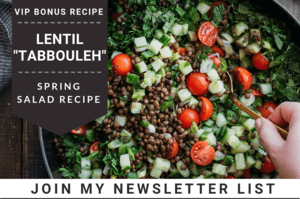 (“Light” does not mean low sodium!) My favorite brand is Pearl River Bridge “Superior”. 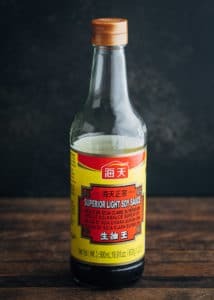 From the photo of the half-full bottle, you can see how often I use light soy sauce in my Chinese cooking! You can buy this soy sauce at brick and mortar Asian markets and online. 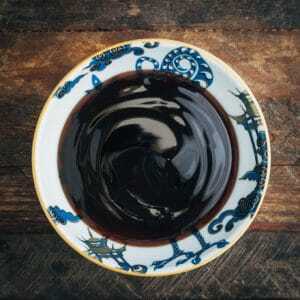 With a darker color and deeper flavor, dark soy sauce undergoes a longer aging process than light soy sauce. It also usually contains molasses or caramel and is slightly thicker (sometimes due to the addition of cornstarch). Dark soy sauce is less salty than light. 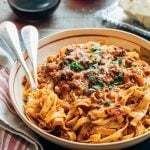 The dark color adds the rich, characteristic caramel color we expect in many Chinese dishes, especially pan-fried noodle dishes, like Chow Fun and Lo Mein. 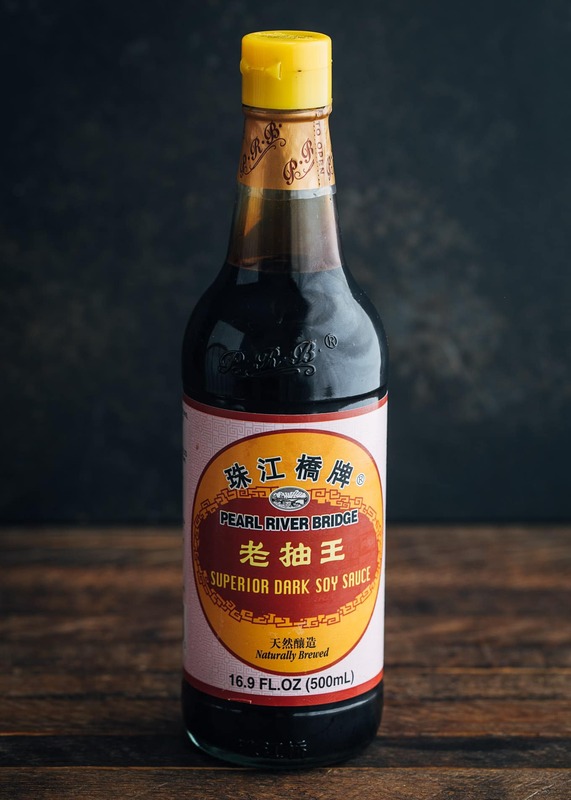 As with light soy sauce, my recipes have been developed with the Pearl River Bridge “Superior” brand, in markets and online. Japanese shoyu uses roasted wheat in the soy fermentation process, without additional flavor or color enhancers, like caramel or MSG. 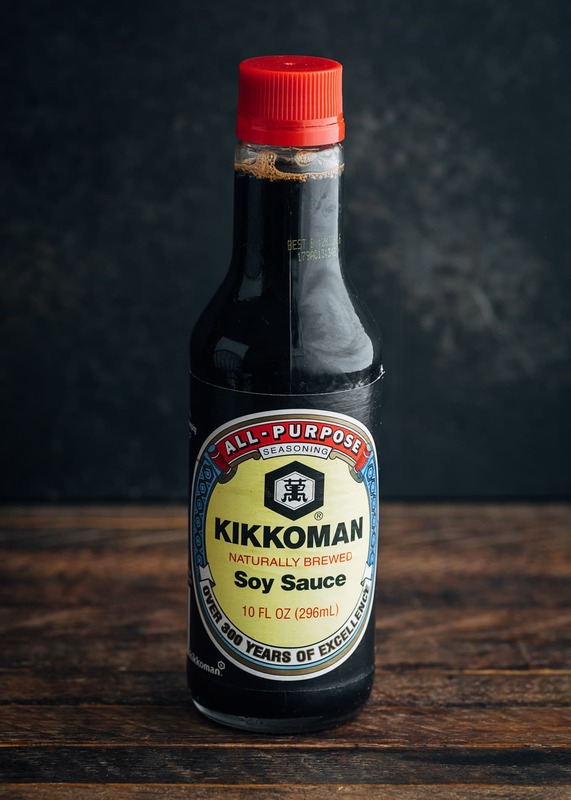 Kikkoman is one of the most popular soy sauces on the market. You can use shoyu as an all purpose soy sauce and substitute it for Chinese light soy sauce in recipes. 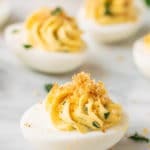 It is a bit sweeter and less salty, so keep that in mind when making the substitution and adjust your salt, as needed. Shoyu is also available in reduced-sodium preparations. Tamari is darker and thicker than shoyu, and is a byproduct of miso. When soybeans ferment to make miso paste, tamari, which translates to “puddle,” is the liquid that forms on the surface in the vat. 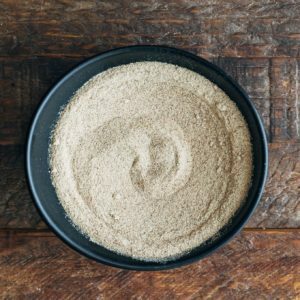 Tamari contains less wheat than shoyu (and in some cases, no wheat at all, making it gluten-free). I love it for a dipping sauce. Like shoyu, you can also purchase tamari in a reduced-sodium version. As the name suggests, oyster sauce is made with the juices from cooked oysters and sweet and savory seasonings like sugar or caramel, soy sauce, and cornstarch. 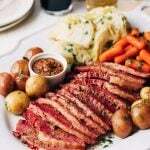 It’s thick in texture, dark in color, deep in flavor, and salty, with a hint of sweetness. Oyster sauce brings a great umami to dishes and is a common addition to stir-fries, such as Beef and Broccoli. I like Lee Kum Kee Premium Oyster Sauce, and if that’s not available, I use their Panda brand. 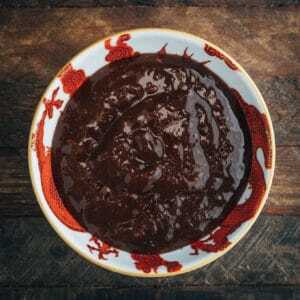 Hoisin is a sweet-salty condiment made from soybean paste. It’s very fragrant, typically containing garlic, vinegar, sugar, sesame oil, and spices. It’s a common ingredient in stir-fries, glazes and marinades, dipping sauces, and accompanying Mu-shu pancakes. Depending on the brand, Hoisin sauce can range from a deep reddish brown to almost black in color. You’ll find it in the ethnic aisle at most grocery stores. While fish sauce is more common in Vietnamese and Thai cooking, it is also used regionally in Chinese cuisine. 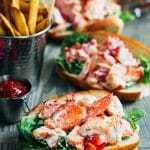 It is made from a fermentation process of salted fish (typically, anchovies) that can take up to a couple of years. 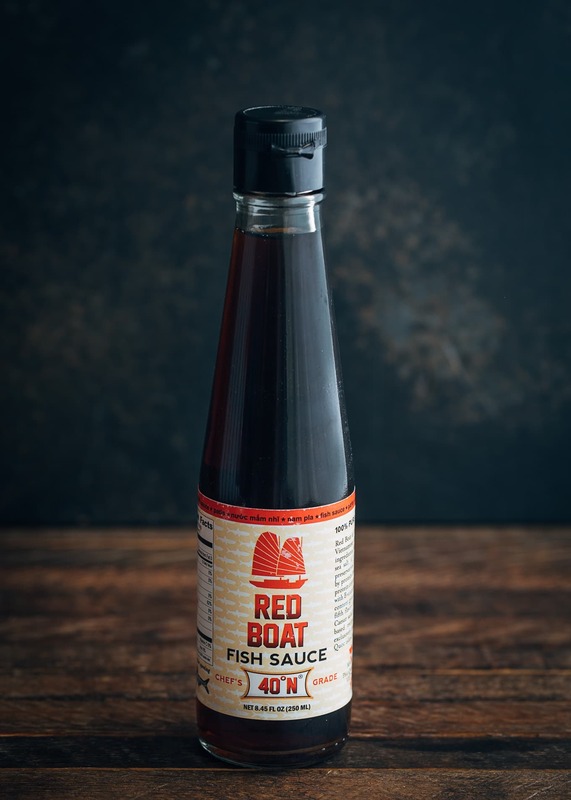 Fish sauce brings a salty, briny, earthy umami to dishes from stir-fries and marinades to sauces and soups. I buy Vietnamese Red Boat Fish Sauce exclusively. 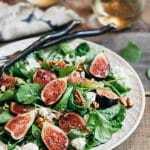 The product is fermented in wooden barrels with just anchovies and salt, without extra preservatives or flavor enhancers. I haven’t found a fish sauce that tops it. 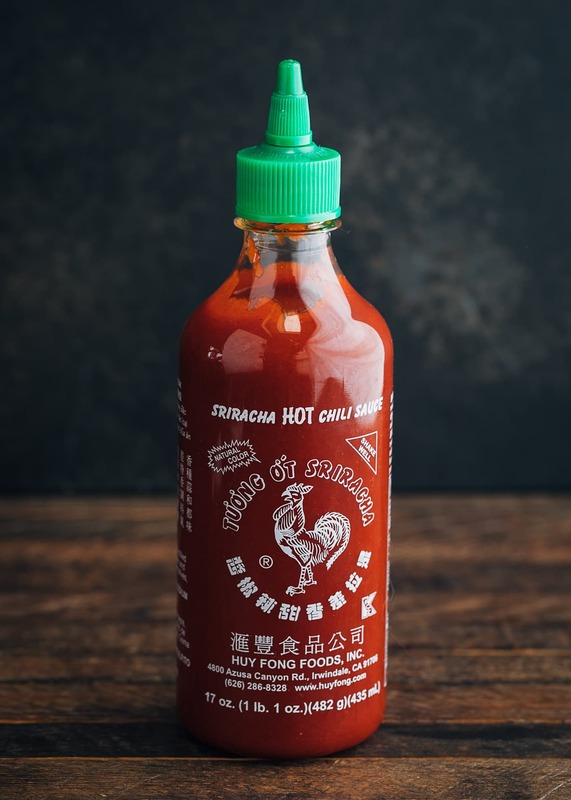 Sriracha is a Thai chili sauce with hot chili paste, vinegar, sugar, garlic, and salt. In Thai cuisine, it’s a classic accompaniment to pho. While Sriracha isn’t traditional to Chinese cooking, I like to keep it on hand for when I want to quickly add a bit of vinegary heat to a dish or a dipping sauce, like for my Chicken Potstickers. I buy David Tran’s popular Huy Fong Foods Sriracha. Look for the green cap and the rooster on the bottle. Other jarred sauces and condiments I often buy for Chinese and Chinese-American cooking include: Plum Sauce, Duck Sauce, and Chinese Hot Mustard. 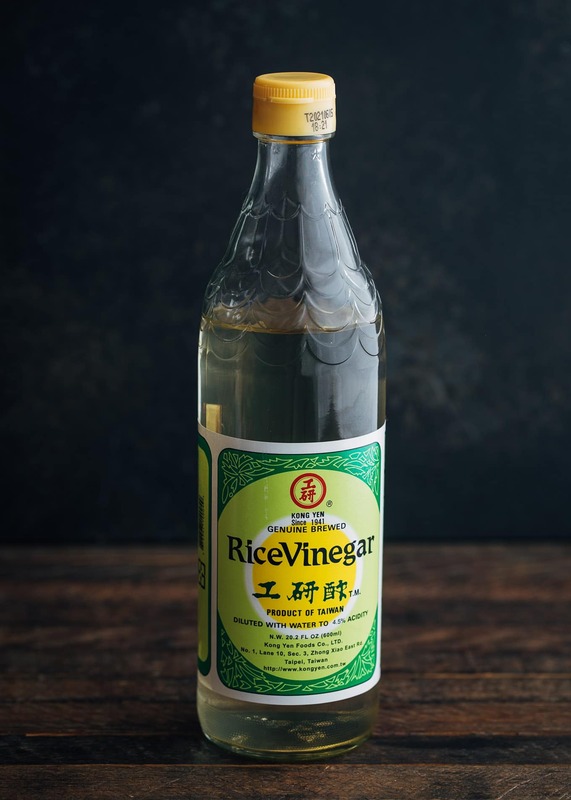 Also called “White Rice Vinegar” or “Rice Wine Vinegar,” this delicate, fermented rice vinegar is mild in acidity, with a bit of fruity sweetness. Given it’s mellow acidity, you shouldn’t substitute distilled white vinegar or wine vinegars for rice vinegar. While rice vinegar’s acidity measures in the low 4% range, distilled vinegar’s acidity comes in at 5%, and wine vinegar, even higher. These vinegars are more assertive and lend more of a sourness to dishes that rice vinegar doesn’t. 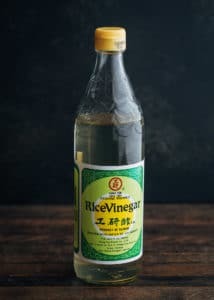 Rice vinegar is available in most grocery stores, Asian markets, and online. 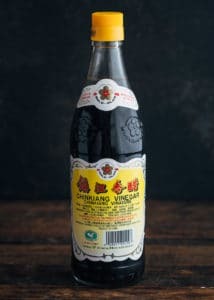 Known as Zhenjiang (pronounced jen-jiAHng) or Chinkiang (chin-kiang) vinegar, Chinese black vinegar is an aged rice vinegar with origins in Zhenjiang province. 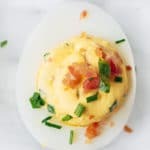 It is a staple in authentic Chinese cuisine. The flavor of Chinkiang vinegar is rich, tart, and lightly fruity, with a pleasant earthiness. Despite having a similarly dark color, it is not as sweet as balsamic vinegar, and I don’t find balsamic to be a good substitute for Chinkiang in recipes. I like the Gold Plum brand. You can buy it at most Asian markets, or order it online. It is an essential flavor component in the sauce for General Tso’s Chicken. Shaoxing wine (also, Shao Xing and Shao Hsing) is a fermented Chinese rice wine that can be used for both drinking and cooking, depending on the quality. It’s pronounced, Shao (the end sounding like “ow”) – shing. It’s an essential component of Chinese cooking, from marinades to stir-fries to dumpling filings and aromatic broths. If you’re looking to recreate the flavors of authentic, restaurant-quality Chinese cuisine at home, a bottle is a must-buy. Not all Shaoxing wine is the same! In order to sell it in general markets without a liquor license, “cooking wine” versions add salt that render it undrinkable as a beverage. I like to buy the unsalted Pagoda brand (from a wine market) whenever possible. If I’m unable to source it and absolutely need to buy Shaoxing cooking wine in a general market, I look at the labels for a bottle with the lowest sodium count I can find. 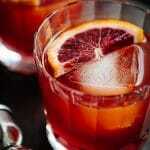 If needed, you can also substitute dry sherry for Shaoxing wine. While the flavor won’t be quite the same, I find the substitution preferable to a very salty cooking wine. Toasted or “roasted” sesame oil brings warm, round sesame notes to many dishes. 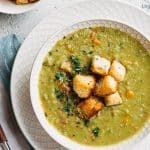 It’s deep in color with a concentrated, aromatic flavor, and a little bit goes a long way. This is an oil that you’ll use to finish or enhance a dish. It is not a frying oil. Look for bottles that are “pure” oil, such as my favorite, Kadoya. I sometimes find this brand in the ethnic aisle at the regular grocery store, and it’s widely available in Asian markets and online. 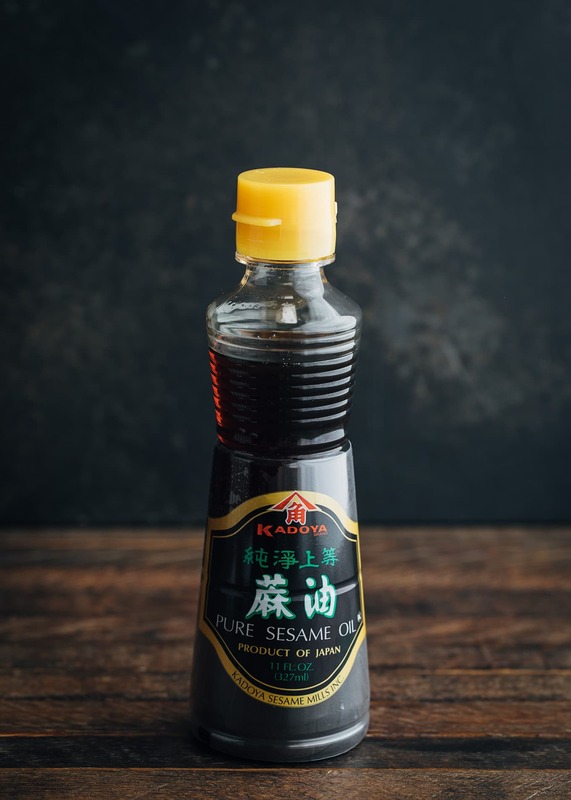 Toasted sesame oil can go rancid quickly at room temperature, so it’s important to store it in the refrigerator after you’ve opened it for freshness. For stir-frying or deep frying recipes like Fried Wonton Strips, I use a high smoke point vegetable oil or peanut oil. I like the latter for the subtle nutty flavor it has. While the FDA doesn’t classify the processed, highly-refined peanut oils as allergens, I always tell my guests when I’ve used it. (Unrefined peanut oils, on the other hand, are allergens.) As allergies can be severe, I like to leave it up to my guests to decide what peanut products they are comfortable consuming. 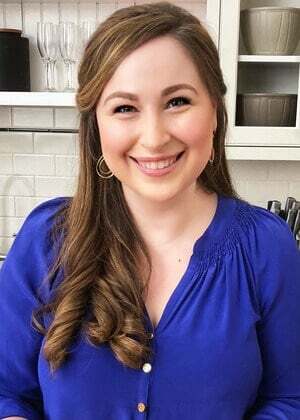 Read more about peanut oil and allergens at The Peanut Institute. If peanut oil is of concern, vegetable oil works equally well. 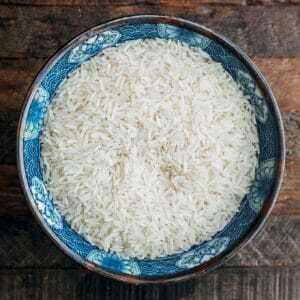 Most of the time, the rice you get in American Chinese restaurants with dinner is Thai jasmine rice. This long grain rice will cook up fluffy and lightly sticky, with a hint of a floral aroma. 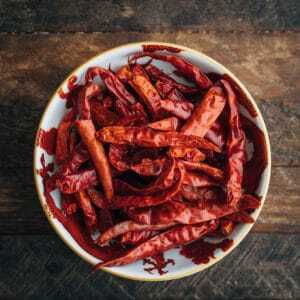 Chinese red chiles (Tianjen, Tien Tsin peppers) are especially popular in Szechuan and Hunan cuisines. They register 50,000 – 70,000 SHU on the Scoville Scale. 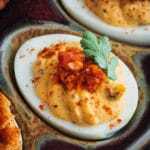 They are very spicy and are often added whole to dishes, like stir-fries, to add heat and removed prior to serving. Tien Tsin peppers can be purchased in Asian markets and specialty spice stores, as well as online. 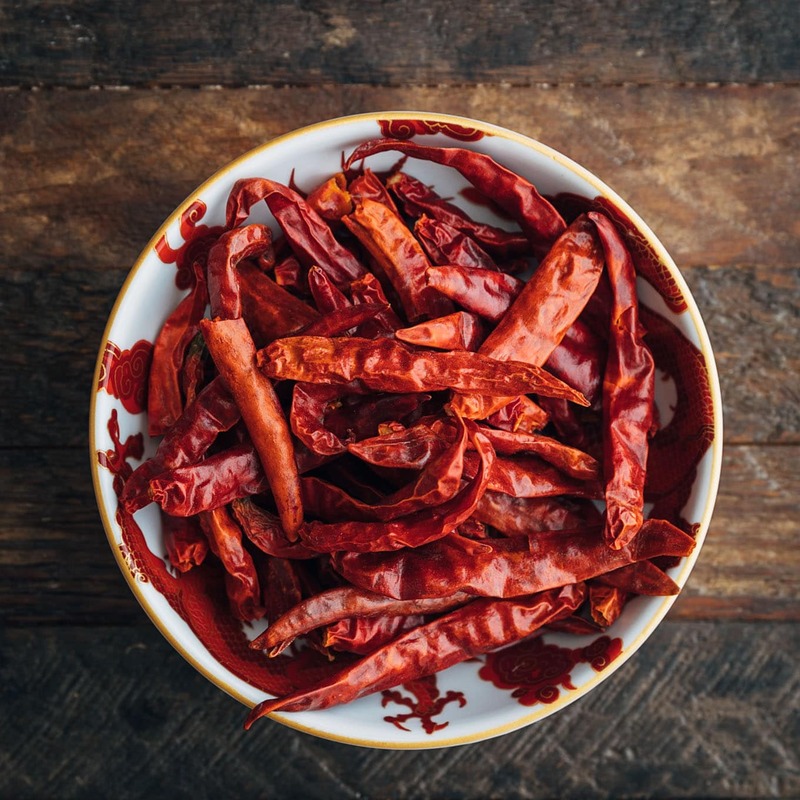 You can substitute Arbol chilies, which are hot, but lower on the Scoville Scale around 15,000 – 30,000 SHU. I often tear them in half and shake out and discard the seeds to bring down the heat level even further. Ground white pepper has a spicy, sharp, lightly-tangy flavor. It’s a common seasoning in Chinese cuisine, especially in soups and stir-fries. While they come from the same plant, white peppercorns differ from black in that a.) they’re harvested fully ripened, and b.) the outer skin is removed from the seed before drying and grinding.